The solstice is still two days away, yet it seems summer has been in full swing for weeks in spite of skies so thick with the seasonal grey we’re accustomed to it’s been misty from time to time. We began celebrating college graduations and finished doctoral work mid-May, then educator friends’ wistful counting of days remaining until the school year ends mingled with cheers for three of our nieces and nephews recently graduated from high school. Somewhere in the shuffle of events, the MoH and I made a quick road trip to San Francisco to collect the RT and his meager belongings. His second semester in college was under his belt and planning for how we’d manage transporting the three of us and his stuff back home became a sort of puzzle considering we no longer had the space my old Acura afforded us. Instead, a MINI would have to get the job done. I thought about it long enough and decided it was possible as long as I could put the MoH and RT on a flight home and I could drive the belongings back to San Diego by myself. I’ve never been that fond of driving. It isn’t the simple act of getting around town that bothers me, but more the amount of attention I have to give others on the road who don’t always seem to act as if they’re even aware of other drivers. When I’m driving I don’t get to look around and enjoy what’s outside my car window — and I like to do that even on routine trips to the market. There’s always something to notice. That’s why I love a good road trip. The longer the better — and preferably in good, sunny weather. There’s something about hitting the road and watching the countryside fly by that appeals to me, but if you’re familiar with California’s central valley, the I-5 can be incredibly dull. For this road trip, I decided we’d take it easy and travel up the US 101 after we got through L.A., stopping along the way to spend a late afternoon and evening in a sort of half way there fashion. Although I wondered about staying in Moro Bay or Cambria, I chose Cayucos — a tiny town surrounded by soft, golden hills and perched on the Pacific coast. I knew I would like it as soon as I saw it on Google maps; a single wide street lined with old buildings and a wooden pier that stretched out into the ocean. It had just enough antique shops and eateries to keep us occupied a few hours once we’d arrived. Traveling from San Diego always requires some thought because getting through L.A. and its traffic can put a damper on any road trip. Do we leave before dawn and miss it entirely? Or do we leave the night before, stay a night in a nondescript place just to get through the city before taking our time the rest of the trip? This time, we decided to time it to just miss the morning commute — and our plan seemed to be working until the MoH, who graciously offered to stop to get me coffee, realized he didn’t have his wallet. You know we have to go back and get it, right? I asked. His face registered surprise and I could tell he hadn’t realized he’d not be able to get on the flight home without identification. There isn’t much to get worked up over after you’ve realized something like this because yes, we would have to turn around and drive the 60 miles back home to get it. And yes. We hit traffic — but not that much. Besides, it gave me an opportunity to look around the old parts of L.A. I actually find nostalgic — if you can call street names we used to hear on the L.A. television stations we grew up watching nostalgic. So that’s where El Segundo is. And look, there’s La Cienega Blvd. Sherman Oaks. The 405 connects with the 101 just over the mountains and eases toward the ocean as the Ventura Freeway before it gently curves its way up the California coast doubling duty as the 1 — the old road. The one we take when we’re not planning on getting anywhere too quickly. I remember the huge, old eucalyptus trees that used to line the old highway, now mostly gone to make way for a much larger freeway and malls that strip away any kind of individuality from a town, leaving it to look like so many others now. There used to be farm stands along the highway there, and as much as I’m sure they’re located elsewhere now, it’s not the same. I was about 19 the first time I took a road trip up the 1 and as much as California has changed in the time that has passed, there are still reminders of what makes the Golden State unique and beautiful along the route. Carpenteria and the state beach that has patches of tar oozing from the earth’s surface. The tiny Summerland easily missed if you aren’t aware it’s there. Montecito. All great places for stops on weekend drives. And Santa Barbara just up the freeway, with its coastal mountains rising sharply into the sky, creating a lush backdrop for a city we’ve stopped to enjoy, but have never stayed a night in. We’ve been thinking more about enjoying places to visit closer to home. Those I’ve just mentioned we’ve passed on the freeway for years — missing the quaintness just beyond us for something instead on the other side of much planning and a lengthy, often expensive flight. As I watch through the window, I make a mental note to find a reason to change that. Several smaller get aways planned throughout the year instead of one big vacation. 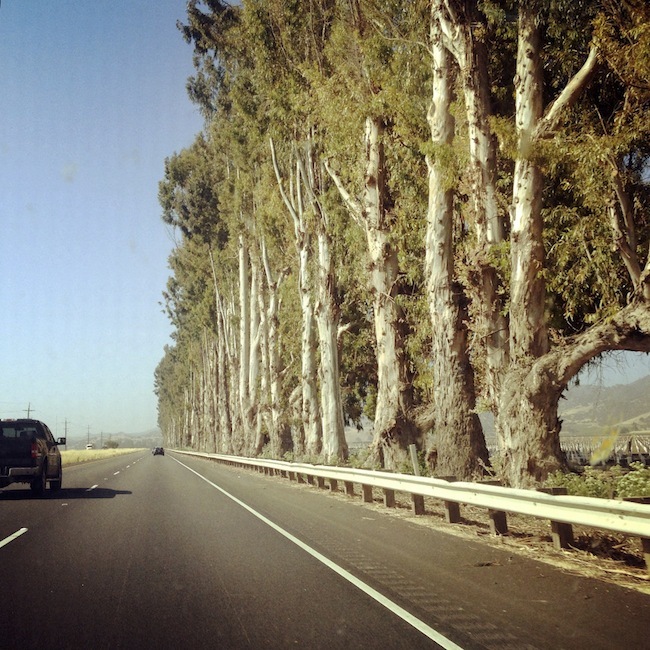 Just past Goleta, the highway veers sharply away from its northwesterly course and heads dead north toward a split. The 1 and 101 will join again at Pismo Beach, just beyond Arroyo Grande where my grandmother and grandfather lived for a good part of their later lives. I remember they enjoyed living there, closer to other relatives I have never known, near San Luis Obispo, and Moro Bay. They used to go on drives for a diversion and to have lunch — something I wonder about whether people do much of any longer. My grandfather liked to drive and I can remember him explaining that once he’d purchased a car, getting the miles out of the warranty early on would let him know whether it had been a good purchase or not. I thought of them both as we sped through the area, heading toward our stop in Cayucos that late afternoon. The drive had been pleasant in spite of the delay early on and we both felt like we wished we had a few days to explore the area more instead of heading to San Francisco early the next morning. Another mental note made to do just that another time. Do you ever play the game of what would it be like to live here when you’re traveling through somewhere new and looking at the houses lined up along the roads, searching for where the people might shop or how far it is to work? We do. And as I looked at the area around Cayucos, I was surprised. It seemed a neat and tidy beach town with homes more expensive that I might have thought. Were they homes affording a beach setting without being as expensive as something farther north or south? I think I liked the idea of it — so different from the palm trees and urban sprawl we’re used to. The grass always seems greener on the other side of the fence, doesn’t it? We stayed at On the Beach Bed & Breakfast that evening, a lovely place next to the old pier in Cayucos. Our upstairs room was a large and comfortable with a fireplace we didn’t take time to light, and a patio overlooking the uncannily quiet main street we didn’t sit on.We did, however, take the time after a brief walk down one side of the main street and up the other, stop back at the B&B for the complimentary happy hour and enjoyed the company of a younger couple celebrating their wedding anniversary. We splurged for dinner at Hoppe’s Bistro and Wine Bar with the Chef’s tasting menu and enjoyed every bite — although we did leave far more full than we’d have liked. We used that as an excuse to walk to the opposite end of town to buy several samples of cookies from the Brown Butter Cookie Bakery, tasted one or two, then saved the rest for next day treats. The next day would start early. We’d have to skip the warm breakfast and do take out with the continental breakfast so we could start our drive. The RT had been cleared to check out of his dorm room and would be waiting for us to pull up to the curb and load the MINI. When your school is downtown San Francisco, there is no parking lot to make this easy. I knew I’d have to stand at the curb in a loading zone along with several other parents, trunks and back hatches swung open and waiting, while several trips to carry the RT’s belongings were made. I’d thought through every second of it paranoid that something would backfire. I’d planned to get up very early the next morning before traffic in the city geared up. The idea of trying to navigate the streets myself with a car so packed I had to use my side mirrors wasn’t all that appealing to me so I’d planned my route as well. And it worked. Only one tiny snag due to road construction gave me a moment of panic before I relaxed to rely on the freeway signs, and I was on my way, speeding along in the opposite direction on the same route we’d taken the day before. Originally, I thought I’d enjoy stopping somewhere along the way for a night so I could do what I mentioned before –see a place I’d passed many times and always wondered about. Perhaps take some photos. Get a sense of what it would be like to stay there, or have a home in a different place. The skies were clear, the sun warmer than I’d expected, and traffic cooperative just until I’d gone through L.A. It allowed me to enjoy what I thought I wouldn’t be able notice while driving back — the golden rolling hills east of Watsonville, Salinas, and Monterey studded with beautiful old Coast Live Oaks. Glimpses of the enormous sand dunes at Pismo Beach. The gentle slope of land that runs right to the ocean just outside of Santa Barbara, broken only by the lanes of the freeway. I finally had to stop in Carpenteria just to get out and rest my aching knee. It was beautiful out and people were lining the side road to cross the train tracks and spend time at the beach. I wanted to be them and on vacation. To be at the beach. What’s so ridiculous about this is that we’re 5 minutes from the beach at home, and outside of doing an occasional walk there, rarely to do sit and enjoy the sun and water. There’s that green grass on the other side of the fence again. Or sand across the tracks in this case. I made it home well before dark in about 10 hours. Not bad for a rookie, I think. Not bad at all. And because we have to take the RT back up to San Francisco for the start of his Junior year mid-August, I’m thinking I just may be able to coerce the MoH to stop along the way home to enjoy a few more of those places we pass on the highway — like Oak Creek Road from Cayucos to the 41. It’s truly breathtaking. And there are lots and lots of wineries. Ahhh, I LOVE your blog posts! Love your writing and descriptions – I was on the road with you 🙂 and love the “vintage” feel of the pics. I want to come back out west and do that drive again. So pretty. I love a good road trip too. But only as the passenger so I can look at the views. And also, I can’t believe the MoH left his wallet at home. Damn, and you had to drive 60 miles back to get it. UGH! And now I really, really, really MISS California. I haven’t been there since 2001. PS: I would have been very nervous navigating my way through those hilly streets of SF with a packed MINI! PPS: 10 hours is GREAT time for a rookie! I love Kellementology!!! Your post was like a travel brochure! I can only imagine how much time it takes, and you have Sass and Veracity to write and take photos for . It is like a job! Keeps you off the street though! Great job! 🙂 I am trying really hard to find a regular writing time. I really am. Hang on, okay? 🙂 ps — I’d be a horrible person to be on the streets.